"I am the president of the republic," shouts ousted Egyptian president as he faces trial over his escape from prison in 2011. Egypt's former Islamist President, Mohammed Morsi, struck a defiant tone on Tuesday, at the beginning of his trial over his escape from prison in 2011, the BBC reported. Morsi started shouting, "I am the president of the republic, how can I be kept in a dump for weeks?" He later began shouting that he was still the legitimate president and asked the judge, "Who are you, who are you?" Morsi was deposed by the military in July after mass protests against his rule. He is now facing four separate criminal trials on various charges. The one which began Tuesday is related to charges of organizing prison breaks with the help of foreign groups. Prosecutors claim that Brotherhood, Hamas, Hezbollah and other jihadists attacked prisons and police stations during the first few days of the revolt against former President Hosni Mubarak, killing policemen and helping thousands of inmates escape. Several Hamas and Hezbollah members were in jail and escaped during the unrest. The ousted president is already on trial for allegedly inciting the killings of opposition activists during his one year in power and he will also stand trial for espionage involving Hamas. Morsi and other defendants in the case are appearing in a sound-proofed glass box during the trial. He will only be permitted to address the court after raising his hand, reported the BBC. At one point, journalists were given the chance to hear what was going on in the glass cage, said the report. The defendants started shouting: "Down with military rule" and the judge cut off the sound. 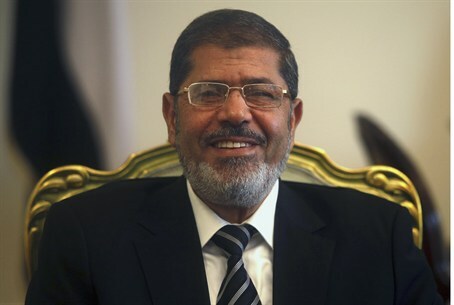 Morsi was taken to the court in Cairo by helicopter from a prison in Alexandria. Tight security was in evidence around the Police Academy in Cairo hosting the trial, with armored vehicles, police officers and military helicopters all visible, the BBC reported. Another 130 people are also facing charges in the prison break trial, but many of the defendants are currently on the run. Since Morsi’s ousters, hundreds of people have been detained and killed and clashes between his supporters and the military have been ongoing. The interim government recently declared Morsi’s Muslim Brotherhood a terror organization, sparking new tensions between the military and the Brotherhood's supporters.